The operation on Tuesday moved quickly, raising hopes that all 12 boys and their adult coach from the Wild Boars soccer team would be at the surface by the end of the day. “We are not sure if this is a miracle, a science, or what. All the thirteen Wild Boars are now out of the cave,” the Thai navy SEALs team, which is helping to lead the operation, said on its Facebook page. 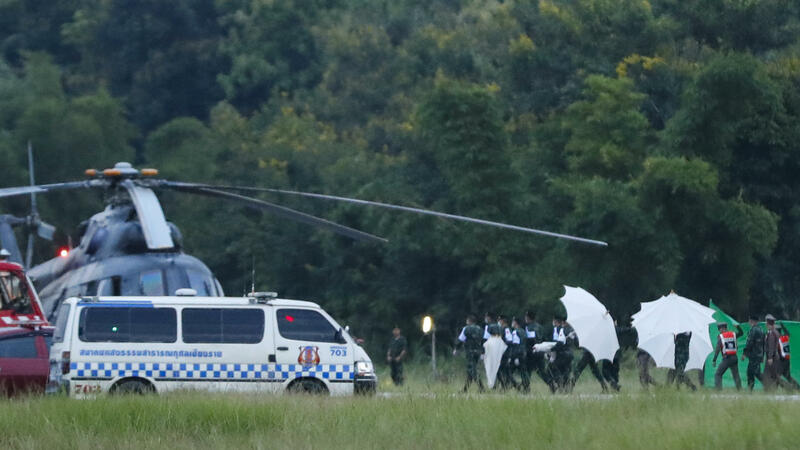 An emergency team rushes to a helicopter believed to be carrying one of the rescued boys from a flooded cave on Tuesday. Divers extracted the last of the 12 boys and their coach who were trapped at Tham Luang Nang Non cave system in the Mae Sai district of Chiang Rai province in northern Thailand. Earlier, the unit had written, “Today, the boar’s pack will be reunited again.” One by one, the last of the remaining four boys were carried to ambulances that whisked them to evacuation helicopters and finally, on to the hospital. Also emerging from the cave: a doctor who has treated the 13 stranded people after they were found last Monday, and several Thai navy SEAL divers who helped to carry out the complicated and precarious rescue operation. Eight boys had been taken out in the past two days — four on Sunday and another four on Monday. The operation included stashing tanks of air on the long route to safety, a process that took hours to set up between rescue missions. Dr. Richard Harris, an Australian anesthetist who is also well-known as an expert cave diver, has been helping to treat the boys and ensure their safe removal. As The Sydney Morning Herald reports, Harris remained in the cave after the last boy left on Tuesday. For more than a week, officials have been pumping millions of gallons of water out of the cave, trying to combat heavy rains on Sunday and Monday. They also worried about dwindling oxygen levels in the cave. Acting Chiang Rai Gov. Narongsak Osattanakorn, who is also head of the joint command center, said that 18 divers and a support team of 100 took nine hours in the second phase of rescues at the Tham Luang cave on Monday, as opposed to 11 hours on Sunday. “We have more expertise than yesterday,” he said on Tuesday. The boys rescued so far are in good overall health despite spending two weeks in the dank cave system, said Jesada Chokedamrongsuk, permanent secretary of the ministry of public health, at a news conference in Chiang Rai. The Associated Press reports that the families of the boys “were being kept at a distance because of fears of infection and the emaciated-looking boys were eating a rice-based porridge because they were still too weak to take regular food, authorities said.” The parents were allowed to see their children through glass at the hospital, according to the BBC’s Jonathan Head. Describing the rescue operation’s final phase, Narongsak said that divers were resting and replenishing air tanks — and hoping for good weather. “If the rain god helps us, then we may be able to work fast,” Narongsak told reporters earlier on Tuesday. “Although his technology is good and sophisticated, it’s not practical for this mission,” Narongsak said of Musk’s mini-sub. Soccer’s governing body, FIFA, has invited the boys to the World Cup final in Moscow on Sunday if they are healthy enough to go.